I’d not paid close attention to Mike Adams, professor of criminology at the University of North Carolina, Wilmington, until the following account came to my attention courtesy of CollegeInsurrection.com, but after you take this in you’ll see why he belongs on the Power Line 100. 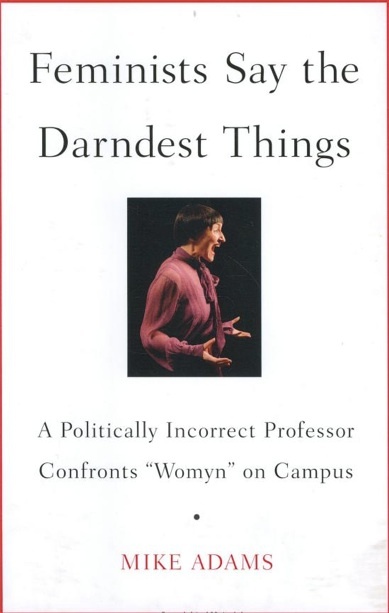 Among other things (like high ratings on RateMyProfessor.com), he’s the author of Feminists Say the Darndest Things: A Politically-Incorrect Professor Confronts “Womyn” on Campus. I can only imagine how this went over. So those are the choices, Ed. You can simply write back and tell me which of these professors, groups, or guest speakers has caused “the biggest embarrassment to higher education” – either in North Carolina or in America altogether. Or you can just concede that our system of hire education is the real embarrassment because it has been hijacked by radical feminism. And please pardon any puns – especially those that take the form of ms-spelled words. Any person this clear-headed deserves our recognition. Turns out he’s had to weather considerable attacks at the university for his heterodox views. I think we’ll want to check back on his federal lawsuit against the university for its harassment.